Reiki (Ray Key) means Universal (Rei) Life Energy (Ki) in Japanese. It is channeled through the open crown, heart and hands of a healer, whose crown has been opened with an initiation through her/his Master. Reiki is taken, not given. It flows through the energizing spirals (Chakras along the front and back of the spine) and from there to the endocrine system. The hormones which are produced there then regulate balance and harmonize the body. The energy releases blockages and therefore leads to relaxation by rebalancing the Chakras, reestablishing harmony and with it holistic healing. It can effectively relieve pain and many acute and chronic ailments very quickly. By healing the physical it also affects the emotional, mental and spiritual levels which often cause physical ailments in the first place. Reiki works on all these levels and not only treats the symptoms/effect but also the reason/cause. It releases tension, anxiety and dissolves stress. It can also help to end habits with drugs, alcohol and smoking. Finally this channeled energy of light creates silence and harmony in the "heart behind the heart”, our soul. One feels more balanced and centered in the moment and therefore happy. The knowledge and use of this energy is ancient but has been named differently in spiritual cultures before Dr. Usui rediscovered it. The energy is called “Ki” by the Japanese, “Chi” by the Chinese, “Prana” by the Indians, “light” by the Christians and “Bio Plasm” by science today. It is totally independent of religion, belief and faith systems, but is spiritual in nature. He understood that all “healing power” flowers from the source of unconditional love and out of inner silence (like motherly love). Many of the healers mentioned in the scrolls where enlightened Masters. Dr.Usui decided to meditate and fast for 21 days on the sacred Mount Kurama in Japan, hoping for some experience. Nothing special happened during those days and disappointed he descended the Mountain. Weakened from fasting, he stumbled over a sharp rock which cut his Achilles tendon. Blood began streaming out and he was under much pain. Intuitively he cupped the wound with his hands. To his surprise the bleeding and pain stopped at once. He realized that “the gift” of healing had happened and named it Rei-Ki. (Universal Life Energy). He returned to the slums and shared his new ability with anybody who was in need, hoping it would help them to quit the slums and earn a living elsewhere. Through his “new” hands and loving heart many physically and mentally ill people got cured. Sadly he noticed that those people did not care to change the quality of their lifestyle. They continued begging, robbing and behaving antisocial. Basically they returned to “slum life” without taking any responsibility for themselves or others and had taken his help for granted. At that point discouraged, he remembered the warnings of a monk with whom he had spoken about healing. He had told Dr. Usui never to forget the soul, while taking care of body and mind. Again Usui retreated to Mount Kurama to meditate and fast for 21 days. At the dawn of the last day a bright light rushed from the sky and entered his third eye. He received powerful symbols from ancient teachings and an understanding about their spiritual insights. From then onwards his teachings included the following principles on which his students where requested to meditate daily. Dr.Usui created a clinic for holistic healing in Tokyo. Soon he became famous as the news of his success and healing power spread. 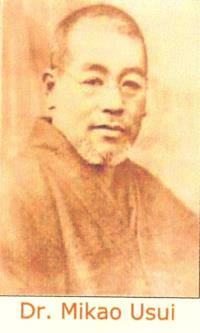 Thus the Usui Reiki Ryoho Gakkai (Usui Reiki Healing Society) was founded. Many came to assist and some of them became his students for life under his guidance. When he saw that a student was ready to work alone he gave his blessings for them to be healers in their own right by always honoring their lineage. Other such healing centers were founded by Usui and they still exist today where his students keep the work alive in his spirit. Before my initiation in Reiki I had learnt several other healing techniques with different Eastern and Western Teachers (Healing trainings and experiences). I had been working with healing and meditation for over a decade when I got initiated in Reiki. 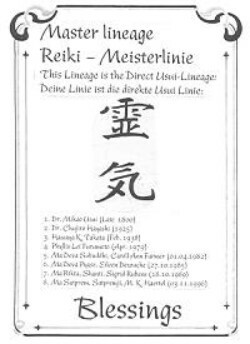 I had always been very skeptical of ‘Reiki’ as it seemed everyone "did" Reiki. It seemed to me that it was just a fashionable trend. Many told me how even though they had never worked on themselves, nor meditated, or worked with any healing, they somehow after a 3days mass initiation became a Reiki Master......How anyone could Master anything in 3days, to me was a mystery and still is. Shortly before my Satguru Poonjaji left his body he suggested that I get initiated in Reiki. Befor that, he had asked me several times to work with healing on Him. Fully trusting his advice I went for the initiation. During the first initiation my Reiki teacher noticed that the crown, my fontanel on top of the head, was already open. During the initiation I felt myself floating in the universe, surrounded by many symbols. 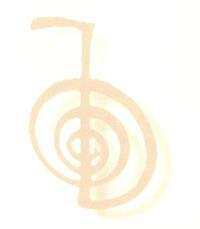 My teacher told me that two of the symbols I later drew for her, were symbols from an advanced Reiki initiation. It was obvious that I must have been initiated into Reiki in some other life. This insight was strengthened by another mysterious happening. While giving a distance healing to my Satguru I received an “energy initiation” by the Buddha (about this I will speak thoroughly in one of my books. Till now I share this experience in detail only with my students). 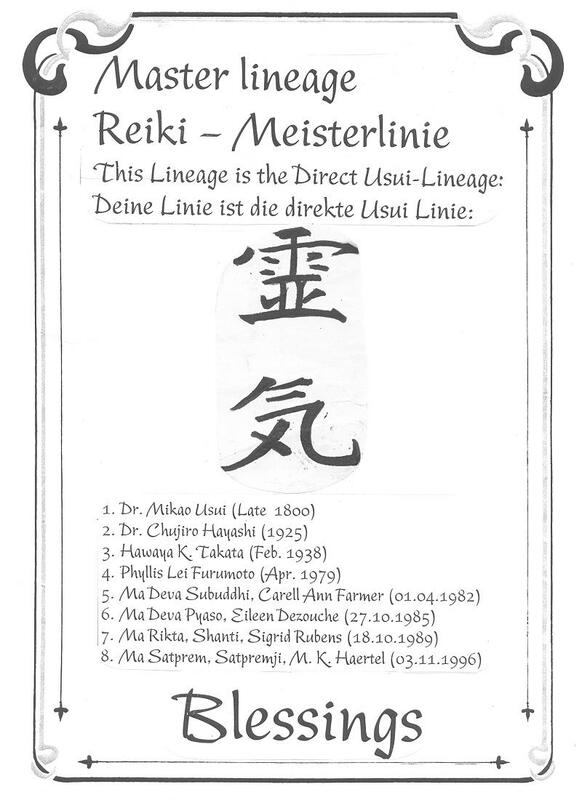 In 1996 I became a Reiki Master-Teacher in 7th line of Master Usui. Since then I have been initiating students and also using Reiki for healings in the Whole-istic Healing Sessions I give. 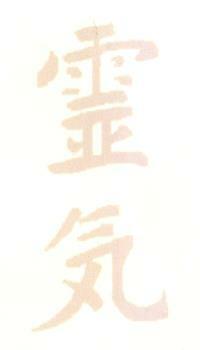 I initiate into Reiki I, II, Teacher and Master. With the 3 day one to one initiation you become my student, one of “my spiritual children” and we are then energetically connected. Afterwards, when you have questions about a life situation and/or spiritual growth I always respond in person, by phone or email. I still receive letters and emails from students I initiated 12 years ago and over the years they continue learning other skills with me. I will only initiate into the higher levels if you have done Reiki I with me. Every teacher works differently so I can not initiate into Reiki II if you have done Reiki I with another teacher. The same is true for the Master and Teacher initiation. This initiation takes 3 days and I only work one on one. I only initiate 2 people at once if they have a close connection (partner, friend, family). This initiation is about learning to go IN through meditation, empowering the self healer and getting connected to the macro cosmos by energetically opening the crown. You learn a special breathing technique, receive 4 initiations and learn 30 positions for self healing. On the 3rd day you do a full session on yourself under my guidance. You receive a certificate after this is completed successfully. It is agreed to do a 21day cleansing afterwards, which keeps the opened crown “sharp”. This is enormously important for any further growth of the student. It means you will give yourself a full treatment every day. In this time the micro cosmos (self) and macro cosmos (the eternal/universe) get reconnected and one moves through many levels of physical, mental and finally spiritual healing. As your teacher, I will give special guidance, advice and be energetically connected to you during this time. You may call or write to me, in case you can’t be around me, to share your developments, problems and experiences. If we consider you to be “ready” you may take the second initiation. This means that you are able to take responsibility for any “problem” you have. It is important that you can take care of yourself BEFORE thinking of helping others. The given symbols empower to give sessions on others and strengthen the self healing. They are also used to cleanse, protect and strengthen ones environment and enable to give distance healing and hypnosis sessions on oneself and others. In this process you go through further depths, learning to ground yourself, become more aware and to consciously disconnect from the ego. At this stage you may experience humility, gratitude and blissfulness. Eventually one feels unconditional love which IS the energy-flow of healing. Many inner doors open and healing energy flowers. If the student is receptive enough I teach Aura reading and how to see Chakras. During the initiation you learn 30 positions to heal others, work with distance healing and do hypnosis on oneself and others. 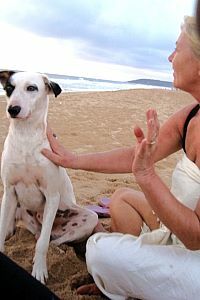 You also learn how to heal animals, plants and the environment. The last day you do a full Reiki session using the symbols on a model, under my guidance. Another model receives a hypnosis session and distance healing is also tested. The certificate is received after all three test sessions are completed successfully. It is agreed to do a 21day cleansing afterwards which means you will give yourself a full treatment every day. With the above exam, certificate and cleansing one is allowed to begin healing on others, preferably on people who are close to you. I will guide, advise and be energetically connected to you throughout this time. You may call me or write to me to share your developments, problems and experiences. Once you get more experience you will notice a more balanced energy in your surroundings. Plants for example reflect your own physical, mental and emotional state. If you are not balanced they will start drying out or losing leaves. By laying hands and symbols on yourself and the plants, you will feel replenished and the plants will begin to shine and grow new leaves. You will begin to understand we are interconnected with our environment. The plants live through us (using carbon dioxide) and we live through the plants (inhaling oxygen). I will give a Master initiation if I see a Reiki II student is ready and wishes to receive the Master. Presuming you have “mastered” giving Reiki healing to yourself and clients successfully and that you have developed your own style of working you are “ripe” to receive the Master. It helps to also learn some other alternative therapy skill, to experiment with, and use it complimentary to Reiki. At that stage meditation is vital to stay grounded and humble. It happens that a student will receive more symbols in dreams which empower your ability. It is important to experience that you are a vessel through which Life Energy is channeled. We are NOT the “do-er” of the healing. You are ready to become a Master if you have committed your life to compassion and love. The initiation takes 3 days and again I only work one on one. During 4 initiations you are given a secret symbol and the Master symbol. Over the initiation time we intensely practice meditation, chant mantras and work with mudras to stabilize the enormous power of the given Master symbols. Personal counseling becomes a part of this process. On the 3rd day you do three full session on a model under my guidance, using the new symbols. You receive the certificate after this is completed successfully. Again you need to do a 21day cleansing which means you will give yourself a full treatment every day using ALL symbols. This will be like a retreat, preferably under my guidance. It is a sensitizing and detoxing process and therefore vital to let go of smoking, alcohol and meat (if you haven’t done so already). Daily meditation is a must. Meanwhile you are allowed to assist your teacher during Reiki I and II initiations, but can not initiate or teach alone yet. You will need some time to adjust and to work with the new symbols and energy flow in your sessions. The soul will be deeply touched and the spirit will move dancing with creativity. You may even go through “dark nights of the soul”, where you need me functioning as “midwife”, helping to give birth to the new . Your whole personality will be replenished, strengthened and maybe even reformed. The Self will start to shine. A genius musician is not necessarily a good teacher. He may master his instrument, but he fails to teach it to a pupil. The same goes with Reiki. Being a Master and a Teacher are two separate skills. To become a Reiki Teacher you must be chosen by your Teacher who will go through the process with you. In this initiation I will open all my teaching materials and secrets to you. We will carefully go through them, step by step and you may bring in your own ideas and experiences as Master. It is important, that you do not copy the way your teacher works, but understand each step and make it your own. It is not a problem, if for example, you can not teach aura reading because you can not see it yourself. Just be honest and total with all that you are at this point. I have learnt a very important truth while teaching. I continuously learn from my students while we work together. This is not learning of the mind but the exchange of hearts and Being. There will be many details you never thought of as you have not played the instrument of being a spiritual teacher yet. After 4 initiations and receiving a personal symbol you will assist in several Reiki I and II initiations, and if possible also in a Master initiation. By watching me while teaching, you will slowly learn about the reasons for the ways I approach a student. During these participations you will get a feeling about approaching different kinds of students. Your intuition will get strengthened, which prepares you to read the psychological state of different people, recognize different characters, difficulties and blocks which are preventing a student from receiving your messages. In the meantime you will need to do a 21day cleansing, using the new symbol with the others, and meditate. When you have finished this training you get my full blessing to work on others, initiate and teach Reiki. You will be fully initiated as Reiki Master- Teacher in my lineage of Master Usui.